George Clooney and Stacy Keibler at the 2013 Oscars. As my colleague Mona Chalabi wrote Wednesday, scarcity may improve our perceptions of bearded men. A new study suggests that the more men who have beards, the less likely it is that they will be viewed as attractive. This raises the prospect of “peak beard,” the tipping point where facial hair will become a hindrance to romance. I respectfully disagree; beards are amazing and always will be. Do I have skin in this game? Sure, I’ve had a beard for almost the entire duration of the Obama administration (see the author photo at the bottom of this post). But let’s take a look at some of the most attractive men to find out how many have rejected the tyranny of the blade in favor of the liberation of the scruff. I found one of the most comprehensive datasets in the field of attractive dudes: Glamour’s Sexiest Men list. Glamour’s research team polled 95,000 people in 2013 to ascertain the 100 sexiest guys. I went though the list to identify how many men fell into each of the new study’s four categories — clean-shaven, light stubble, heavy stubble and full beard — based on photos in a Glamour slide show (of course, celebrities’ facial hair styles can change frequently). Although the grades of beards were sometimes difficult to distinguish — other judges may disagree on the line between light and heavy stubble — the line between clean-shaven and scruffy was more than distinct enough to compile a reliable comparative set. The results, frankly, speak for themselves. 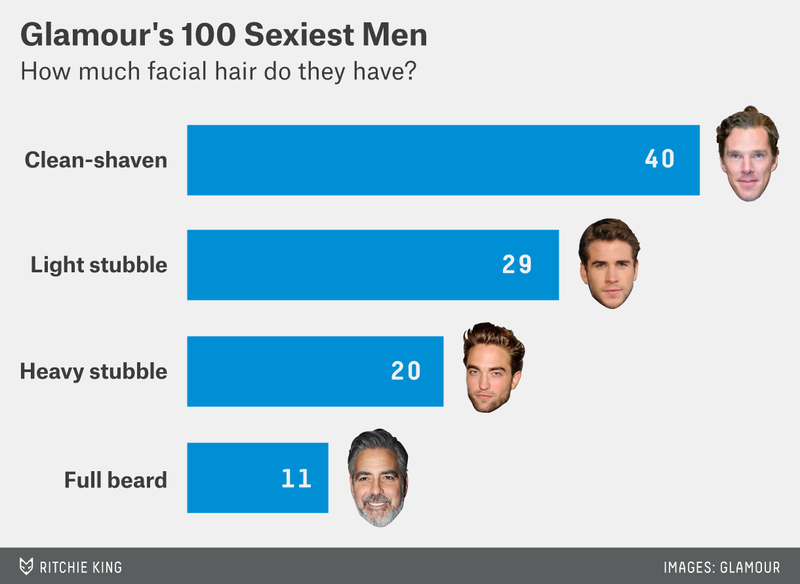 You’ll notice that 60 percent of the men on Glamour’s list have some facial hair. But fewer men have demonstrated the commitment necessary to grow full beards. Almost a third have only light scruff, and that’s just a toe dip into beardedness. Heavy scruff stubble is scarcer. About 20 percent of the men on the list have cultivated thicker scruff, surely a greater demonstration of dedication and other positive evolutionary qualities. And the highest echelon of beards, reserved for those who made the plunge from heavy scruff to full beard, is dominated by the likes of George Clooney and Brad Pitt. Again, I’m biased, but that’s good company.